The main difference between ASCII and EBCDIC is that the ASCII uses seven bits to represent a character while the EBCDIC uses eight bits to represent a character. It is easier for the computer to process numbers. But it is a difficult process to handle text. Therefore, the characters are encoded. 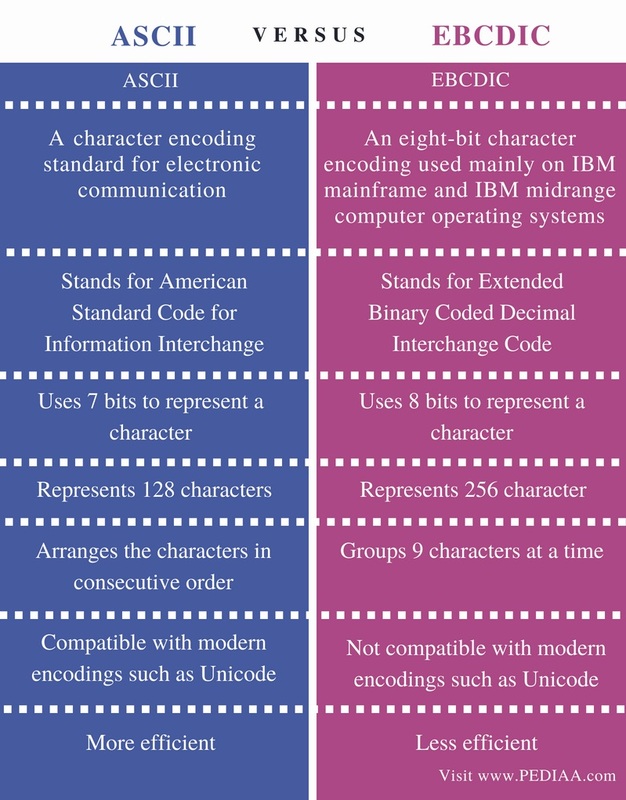 There are various character encoding standards, and ASCII and EBCDIC are two of them. They help to represent test in computers, telecommunication devices, and other electronic devices. ASCII represents 128 characters. ASCII is compatible with modern encodings and is more efficient. On the other hand, EBCDIC is mainly used for IBM based systems. It represents 256 characters. ASCII stands for American Standard Code for Information Interchange. It is an encoding standard that represents digits, letters, and symbols using numbers. The digits can be 1, 2, 3, etc. while the letters are a, b, c, A, B, C, etc. The symbols are characters like !, $, and #. Therefore, it is possible to convert any piece of text to the corresponding set of numbers using ASCII. This conversion makes it easier to store them in the computer memory. The corresponding ASCII value of character ‘B’ is 66. The ASCII value of ‘b’ is 98. 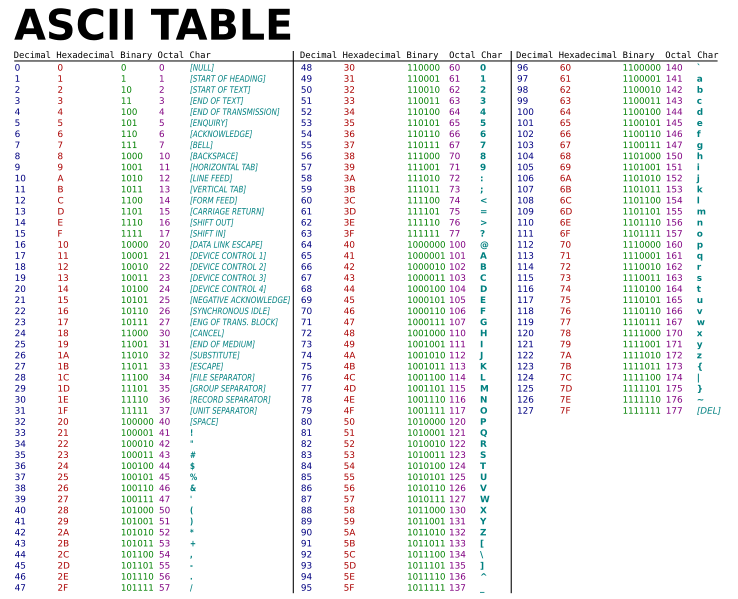 The ASCII table contains ASCII values for all corresponding digits, letters, and symbols. ASCII uses 7 bits to represent a character. It represents a maximum of 128 (27) characters. ASCII is mainly used in programming, data conversions, graphic arts and text files. However, one issue in ASCII is that it can only represent 128 characters. It does not have representations for letters in other languages such as Greek and Arabic or mathematical symbols. There is a new version of ASCII called Extended ASCII. It includes the standard ASCII characters with additional characters. EBCDIC stands for Extended Binary Coded Decimal Interchange Code. It is mainly used on IBM mainframe and IBM midrange computer operating systems. It is also supported by some platforms other than IBM. EBCDIC uses 8 bits to represent a single character, and it represents a 256 (28) alphanumeric and special characters. There are several disadvantages to EBCDIC. When compared to ASCII, the same character which takes 7 bits to represent in ASCII will take 8 bits in EBCDIC. Therefore, EBCDIC is less efficient than ASCII. Moreover, when considering the arrangement of characters, EBCDIC groups 9 characters at a time. Furthermore, it is not compatible with other encodings such as Unicode. ASCII is a character encoding standard for electronic communication. EBCDIC is an eight-bit character encoding used mainly on IBM mainframe and IBM midrange computer operating systems. ASCII stands for American Standard Code for Information Interchange. EBCDIC stands for Extended Binary Coded Decimal Interchange Code. Further, ASCII uses 7 bits to represent a character. EBCDIC uses 8 bits to represent a character. Also, ASCII represents 128 (27) characters while EBCDIC represents 256 (28) characters. Moreover, the same character in ASCII requires 7 bits, but EBCDIC required 8 bits. Therefore, ASCII is more efficient than EBCDIC. Besides, ASCII arranges the characters in consecutive order. EBCDIC groups 9 characters at a time. Additionally, ASCII is compatible with modern encodings such as Unicode. It is possible to open ASCII files with Unicode. On the other hand, EBCDIC is not compatible with modern encodings such as Unicode. ASCII and EBCDIC are two character encoding standards. The main difference between ASCII and EBCDIC is that the ASCII uses seven bits to represent a character while the EBCDIC uses eight bits to represent a character. 1. “ASCII.” Wikipedia, Wikimedia Foundation, 12 Aug. 2018, Available here. 2. “EBCDIC.” Wikipedia, Wikimedia Foundation, 10 Aug. 2018, Available here.